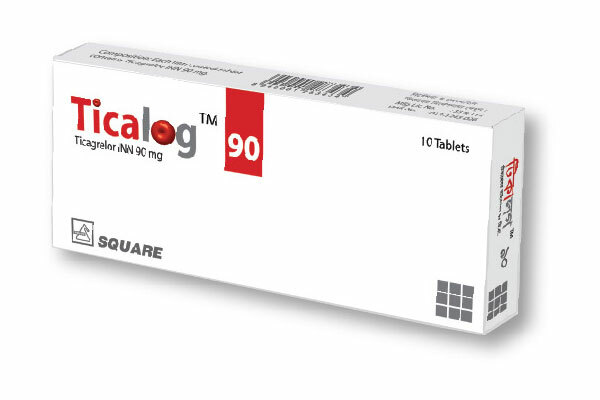 Ticalog™ 90 tablet is indicated for the Prevention of Atherothrombotic events in adult patients with ACS (STEMI, Non-STEMI, Unstable angina) & PCI management. Ticagrelor treatment should be initiated with a single 180 mg loading dose (two tablets of 90 mg) and then continued with 90 mg twice daily. Patients taking Ticagrelor should also take aspirin daily, unless specifically contraindicated. Following an initial dose of aspirin (usually 325 mg), Ticagrelor should be used with a maintenance dose of aspirin of 75-100 mg. Treatment is recommended for up to 12 months unless discontinuation of Ticagrelor is clinically indicated. Ticagrelor can be administered with or without food. Ticalog™ 90 Tablet: Each box contains 10 tablets in Alu-PVDC blister pack.